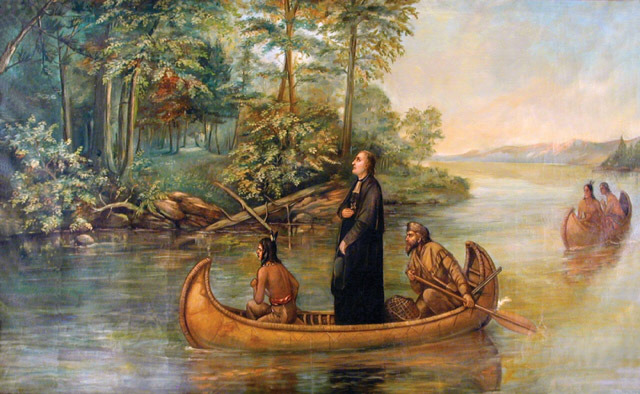 On May 17, 1673, Father Jacques Marquette and fur trader Louis Joliet set out on a four-month voyage that carried them thousands of miles through the heart of North America to explore the path of the Mississippi River. Their voyage helped to initiate the first non Native-American settlement settlements in the North American interior that introduced Christianity into 600,000 square miles of wilderness, gave French names to cities from La Crosse to New Orleans, transformed traditional Indian cultures, and nearly exterminated the fur-bearing mammals of the Upper Midwest. The two explorers were an unlikely pair. Father Jacques Marquette was a studious Jesuit two weeks shy of his 36th birthday. His partner, Louis Joliet was a 27-year-old philosophy student who had become a fur trader. In two canoes paddled by five voyageurs, Marquette and Joliet left St. Ignace, at the head of Lake Michigan, on May 17, 1673. They crossed Wisconsin between June 1 and June 17, then followed the Mississippi River hundreds of miles south to Arkansas. On July 16, near the mouth of the Arkansas River across from modern Rosedale, Mississippi, they turned around. They had gone far enough to confirm that the Mississippi drained into the Gulf of Mexico but not so far that they would be captured by the Spanish. On Sept. 30, 1673, they arrived at St. Francis Xavier Mission at modern DePere, Wisconsin. Marquette and Jolliet did not discover the Mississippi. Indians had been using it for thousands of years, and Spanish explorer Hernan De Soto had crossed it more than a century before them. They did confirm, however, that it was possible to travel from the Great Lakes all the way to the Gulf of Mexico by water, that the native peoples who lived along the route were generally friendly, and that the natural resources of the lands in between were extraordinary. Equipped with this information, French officials led by the explorer LaSalle would erect a 4,000-mile network of trading posts to systematically exploit those riches over the next century and a half. Both men kept records of the voyage. Marquette's original journal lay unread in a Jesuit archive in Montreal for nearly 200 years. The following spring, Joliet headed home with the expedition's other records but outside Montreal his canoe overturned and all his notes were lost. A few weeks later, he was interviewed about where he had gone and what he had seen. Both men also drew maps of their voyage. Marquette's journal was first published in Paris in 1681, much condensed and accompanied by the first map of the entire Mississippi River.